Can I Connect a Galvanized Pipe to a Brass Faucet? Galvanized steel pipe has been coated with a very thin layer of zinc to prevent it from rusting. According to Grassroots, this type of pipe is often found in homes 50 years old or older. It was common in the 1960s. Galvanized pipe was often used because of its lower cost, compared to the higher-quality copper or brass piping then available. Unfortunately, this kind of pipe is also less durable than copper or modern plastic piping, and has a number of disadvantages. Galvanized steel pipe is subject to corrosion. Homeowners should expect no more than 40 years of use from galvanized pipe, though it may last a little longer. According to Home Doctor, galvanized steel pipes eventually rust from the inside out, and must eventually be replaced. Home Doctor notes that pipes with rust on the outside will often begin to leak within a year or so, and that small cracks in galvanized pipes can be repaired using a clamp. Large cracks cannot be fixed, and the whole pipe needs replacement. 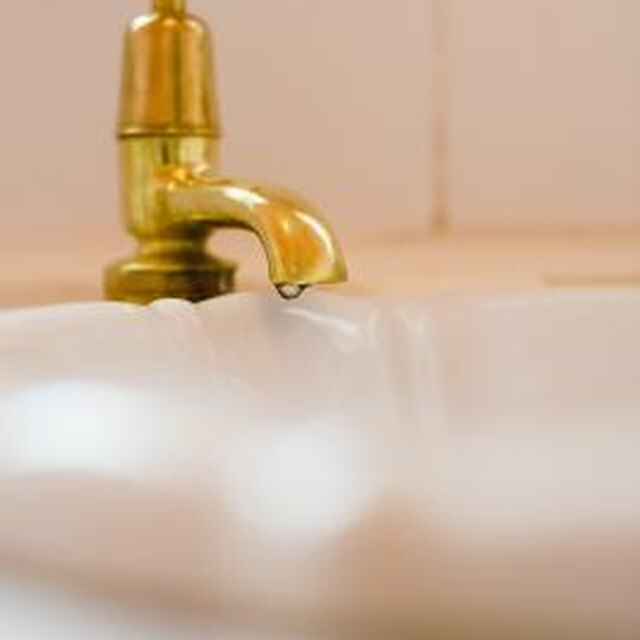 If tap water is brownish or fixtures are rust stained, your pipes may be corroding. Galvanized pipes clog easily, especially as they get older. Rust and mineral deposits accumulate on the inside of the pipe, eventually stopping the flow of water completely. According to Ask the Builder, vertical galvanized water lines don't collect sediment as quickly as water lines that run horizontally. Most galvanized pipes create water pressure problems before they close up completely. If your home's water pressure has been steadily decreasing, the problem may be the water supply lines. Galvanized pipes are incompatible with standard brass or copper valves and fittings. According to Love Plumbing and Remodel, when steel and brass or copper meet, the steel pipe corrodes much more quickly. Some joining techniques reduce this effect, but do not completely remove it. Ask the Builder recommends that homeowners who want to replace galvanized steel or iron pipe in their homes remove all the galvanized pipe at once. Connections between the new copper pipe and old galvanized pipe can break down quickly, creating leaks and clogs. What Is a Rough Plumbing Inspection Code? How Often Do You Have to Seal Log Homes? How Do Water Pipes Connect to a Home?